During a first round NCAA tournament game the #2 seed Michigan State Spartans played the #15 seed Bradley University. MSU was a heavy favorite. During the first half though, MSU was down eight points. Three times in a row, freshman Aaron Henry failed to get back on defense, and three times Bradley scored. Coach Izzo initially yelled at Henry. 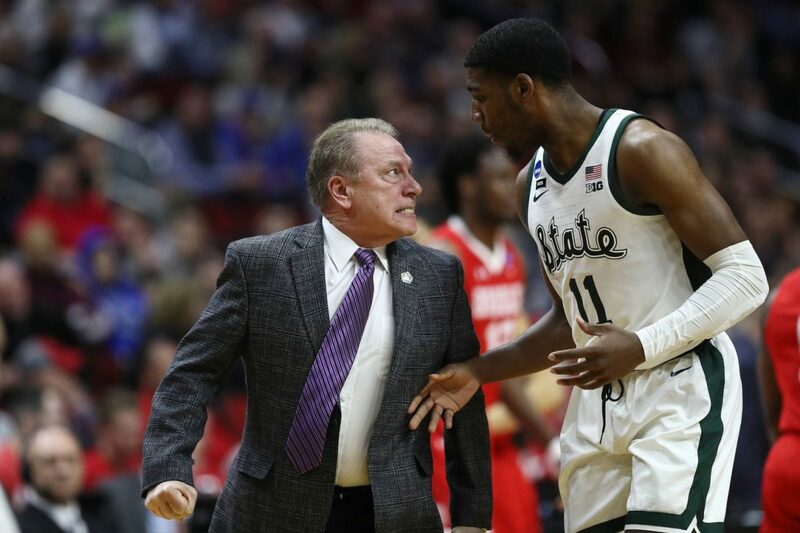 Henry said, “My bad coach.” However, after the 3rd time, Coach Izzo met Henry at half court, pointed his finger, clinched his fists and verbally confronted Henry. Izzo then went after Henry again during the huddle. Other players intervened and sat Izzo back down. MSU went on to win that game by a sizable amount. This video was replayed over and over by the media. It was the talk of the tournament. Media scrutinized Izzo. Some in the media berated him and said he crossed the line. Others defended him and said he was simply holding a player accountable. Pro Argument – Izzo Crossed the Line: Coach Izzo went too far. He lost his cool. He embarrassed a freshman player in front of 15,000 fans. No player should have to endure such behavior. This is education-based athletics and Izzo’s tyraid has no place in college sports. Henry was trying his best. Izzo can get his message across to the kid in a different manner. What if this had happened in high school? Would a high school athletic director allow this type of behavior from the head basketball coach? No. So, why then is it not okay for a 18 year old high school athlete and okay for a 19 year old college athlete? Con Argument – Izzo Challenged his Athlete: Coach Izzo lost to a #15 seed two years ago. After that loss, he said that he didn’t do enough. He didn’t confront his players. He didn’t hold them accountable in the moment. As Izzo said after this year’s game, “The ‘my bads coach’ are out the window. This is one and done.” Coach Izzo was simply challenging his player. This was an “effort issue.” Henry was not hustling back and defense. This had a direct impact on the score. Coach Izzo was simply challenging his young freshman to play harder and understand the importance of the moment. You have to understand that Coach Izzo has a solid relationship with each of his players. They know how much he cares. Five days earlier, a player went down with a season ending injury. Izzo openly cried on the court for this kid. It’s because of this relationship that Izzo can challenge all his athletes in the moment. He didn’t put his hands on the kid. Every one who plays for Izzo knows what they are getting into. They get the love and they also get challenged. Not one of his players or former players had a problem with Izzo’s behavior. No one at MSU had a problem with his behavior. So, why should you? Your Turn: What do you think of Izzo’s behavior? I think coach Izzo is an experienced enough coach to know when he’s crossing the line. We don’t know what is said between him and the player but it was most likely acceptable constructive criticism. He’s a great coach. Coach Izzo is a very successful coach. He knows what it takes to win games, and if his player continued playing the way he was playing, MSU wasn’t going to win. He has the deserved respect to do what he did.